Los Angeles talent manager Benita Hawkins has returned to tiny Trinity Falls, Ohio, to visit her elderly great aunt Helen--and hopefully convince her to move to assisted living. But that's not the only move Benita hopes to inspire. After years of hometown hookups with her childhood sweetheart, university band director Vaughn Brooks, Benita wants more: for Vaughn to move to L.A. and settle down with her. She even gets involved in his work, planning to lure him to the City of Angels. . .
Vaughn has loved Benita since high school, but he also loves Trinity Falls. Hoping to seduce her to stay, he asks Benita to help out with the local production of his original musical. But when Benita takes her role too far, she may have blown both their dreams--unless she can prove to Vaughn that they want the same things out of life after all. 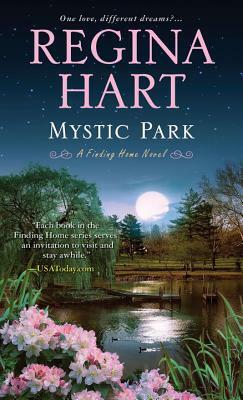 . .
Regina Hart's small-town romances take place in the fictitious community of Trinity Falls, Ohio. Growing up in New York, Regina's neighborhood reminded her of a small town, where everyone knew each other and watched out for the neighborhood kids. Regina now lives in Ohio with her husband. Regina loves barbecues, sports--college as well as pro--and hiking with her husband. Learn more about Regina on her website AuthorReginaHart.com.